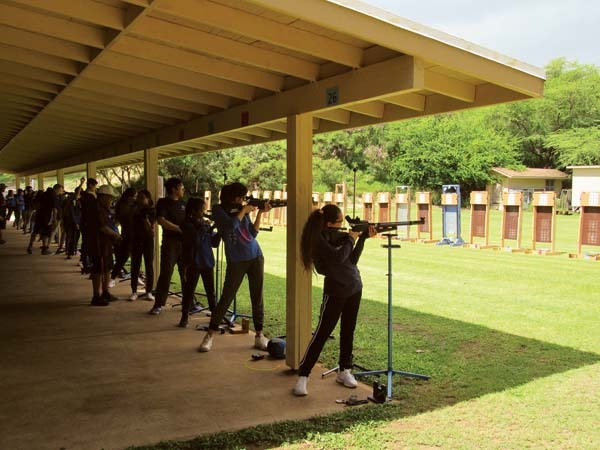 WAILUKU — With head coach Jon Gushiken out of town, Baldwin High School’s first-year assistant coach Solomon Palad was in charge as the Bears hosted Saturday’s Maui Interscholastic League air riflery shoot No. 3. Quite a change in role for Palad, who only last year was competing for the Bears during his senior season. “I thought hosting would be a big obstacle for me, but I got help from a lot of the other coaches to step up and help,” Palad said. Palad said adjusting from teammate to coach is something he’ll have to get used to, but he enjoyed his first experience. After taking the top spots in both the girls and boys postal meet last week, Baldwin finished in third behind Maui High and Kamehameha Maui. Baldwin’s Reece Ugalino said there was additional pressure at the meet compared to last week’s postal. Ugalino was Baldwin’s top boys scorer, finishing in fifth place with 245 points. Maui High took the top spot in the girls and boys team event with scores of 990 and 976, respectively. The Sabers’ Venus Versola was the top girls finisher with a score of 263, five points ahead of St. Anthony’s Fiona McGrath. Kamehameha Maui’s Kuualoha Bailey (253) placed third. The Warriors’ Joshua Grant was the top boy finisher with a score of 258. Justin Bio (251) of Maui High placed second and Sabers teammate Jordan Shim (249) was third. * Matthew Simon is at msimon@mauinews.com. 1. Maui High girls 374-298-334‚990: Venus Versola 94-85-84–263; Kaitlyn Otani-Hernandez 93-66-87–246; Shmily Versola 91-76-77–244; Kamila Hera 96-59-82–237; Jenna Payba 88-59-81–228; Alexis Viloria 89-65-71–225; Jourly Versola 80-57-78–215; Taylor Macias 81-71-44–196; Shyla Orquia 80-58-49–187. 2. Maui High boys 364-294-331–976: Justin Bio 87-78-86–251; Jordan Shim 92-72-85–249; Dane Payba 96-74-76–246; Joshua Cui 88-65-77–230; Evan Aquinde 87-70-72–229; Jordan Tavares 80-68-81–229; Ronel Yadao 87-66-74–227; Issac Olsen 81-66-73–220; Davin Toguchi 88-53-79–220; Mason Bailey 65-40-62–167. 3. Kamehameha Maui girls 355-281-330–962: Kuualoha Bailey 92-74-87–253; Naliko Cabanilla 86-73-79–238; Bailey Ventura 87-67-84–238; Teani Kaluhikaua 87-66-80–233; Ka’ililau Pu’u 85-60-77–222; Aleina Reyes 73-67-79–219; Nanea Ah You 81-63-69–213; Kuumana Bailey 82-61-69–212; Isabelle Greig 89-51-70–210; Ku’umaka Ruidas 71-32-38–141. 4. Kamehameha Maui boys 343-296-309–945: Joshua Grant 82-87-89–258; Kody Cambra 92-76-77–245; Coian Hett 87-72-78–237; Koalele Spencer 79-61-65–205; Rylee Andaya 67-54-63–184; Gabriel Arcas 82-38-45–165; Jai Mashino 63-49-48–160; Jaston Patao 49-39-63–151. 5. Baldwin girls 357-279-322–939: Emi Sakumoto 91-65-90–246; Kaysha Villlaverde 87-75-76–238; Lexie Galam 81-73-75–229; Malia Kaiahua-Sato 79-66-81–226; Mikeala Kealoha 94-59-70–223; Caitlin Ramiscal 84-65-70–219; Aliyah Guico 85-52-71–208; Anna Fosbinder 81-50-65–196; Aeszalyn Ortogero 72-58-60–190; Brielle Fernandez 73-35-71–179. 6. Baldwin boys 324-286-290–876: Reece Ugalino 81-78-86–245; Charles Duarte 77-74-66–217; Andrew Hamamura 86-55-72–213; Makalii Sequeira 72-67-62–201; Daniel Garcia 80-49-66–195; Jaden Pladera 61-67-59–187; Chandler Tumaneng 67-52-54–173; Jarin Tateishi 65-49-50–164; Shayne Enomoto 65-46-37–148; Aaron Nakamura 47-35-42–124. 7. King Kekaulike boys 343-272-281–874: Riley Williams 89-78-73–240; Justin Kawamura 92-70-69–231; Kapono Mossman 80-77-71–228; Jonathan Lane 82-25-68–175; Ely Lopez 70-47-54–171; Estin Tantisira 24-17-42–83. 8. Seabury Hall girls 344-240-297–866: Egesu Berkmen 85-80-75–240; Elena Hickey 83-58-72–213; Eva Ponting 86-45-81–212; Taylie Kawakami 90-43-68–201; Linda Schmitt 80-54-67–201; Dyani Pierner 70-48-65–183; Alara Berkman 68-47-67–182; Audrey Ng 61-39-69–169. 9. King Kekaulike girls 233-167-156–556: Keauli’iokalani Nagata 93-83-77–253; Kali Spalding 76-65-49–190; Jaylynn Poaipuni 64-19-30–113. 10. St. Anthony girls 181-137-160–478: Fiona McGrath 93-74-91–258; Brianna Leval 88-63-69–220. 11. St. Anthony boys 160-107-135–402: Max McGrath 86-68-73–227; Michael Vergel de Dios 74-39-62–175. 12. Hana girls 50-29-32–111: Marley Moeai 50-29-32–111. 13. Hana boys 51-5-19–75: Kayden Kaauamo 51-5-19–75.